Today I’m making Swedish Pancakes. 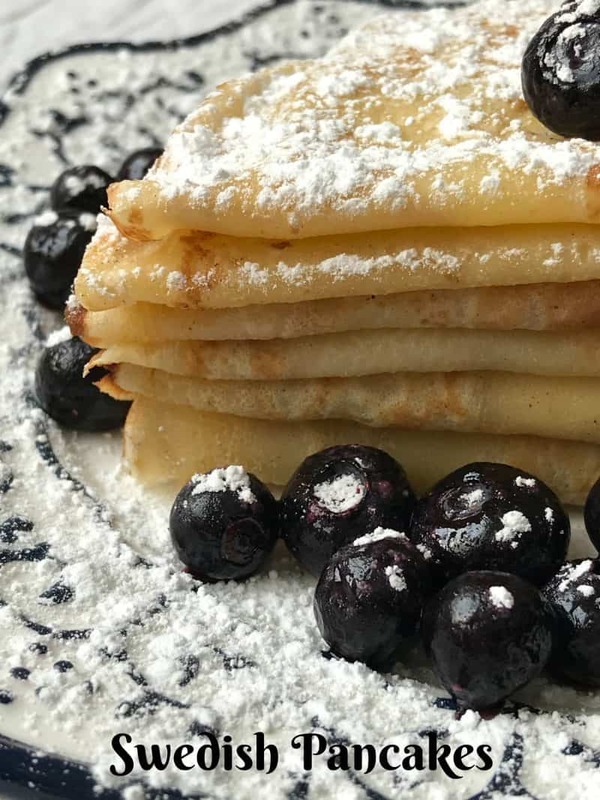 Swedish Pancakes are a very close relative to the French crepe. Thin, delicious and can be filled or served with just about anything. 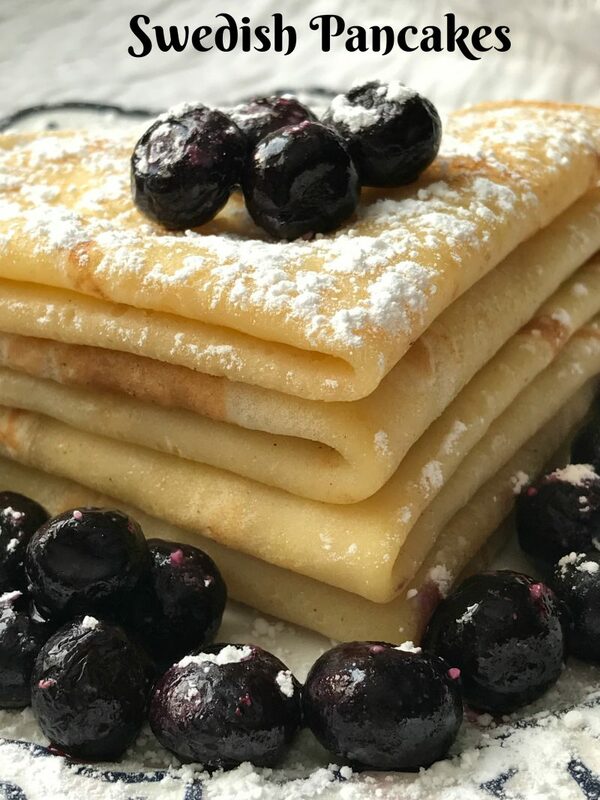 We served these light, thin and yummy pancakes with fresh blueberries and a sprinkling of powdered sugar. 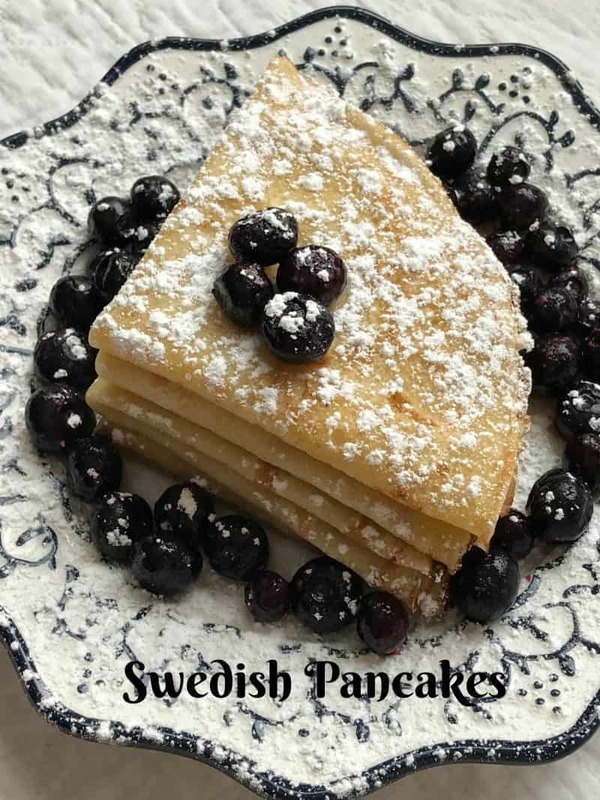 The more traditional way to serve Swedish pancakes, is with a couple spoonfuls of lingonberries or lingonberry preserves and a swirl of whipped cream. A few weeks ago, I stopped at a thrift store that I frequent in Wabeno WI. 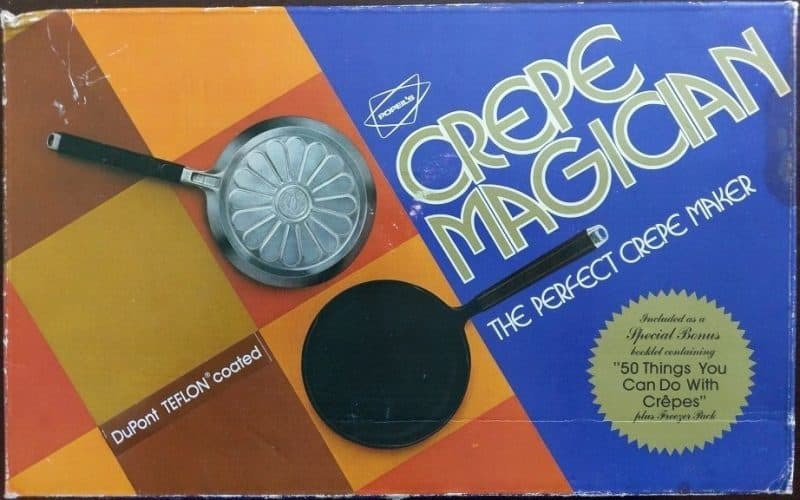 While there, I found a vintage 1975, Popeil’s crepe magician. 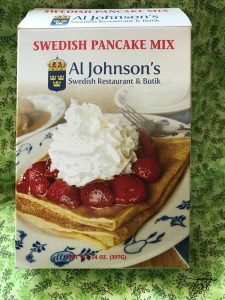 It appeared to be in it’s original box and the only thing missing was the recipe booklet, I wasn’t concerned about the recipe booklet because I already had my box of Swedish pancake mix and was going to follow the recipe on the box. I looked at the price, it read $1.00…that’s a no brainier…I tossed the box into my cart. 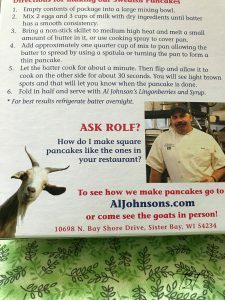 Al Johnson’s is an authentic Swedish family owned restaurant where you can find goats grazing on the sod roof. It’s quite a sight, and it’s made this place one of the most famous restaurants in Door County. Inside the casual dinning room young ladies in Scandinavian outfits serve up a variety of Swedish fare, from pancakes with lingonberries to Swedish meatballs, whitefish, sandwiches, salads, and a variety of hot and cold plates. As you top the hill and head down the main street in Sister Bay, right in the middle of town, you will spot the goats on the roof at Al Johnson’s Restaurant. The grassy roof with goats grazing on the top, have drawn tourists and locals alike. An icon for visitors for over 58 years, Al Johnson’s Swedish Restaurant has a rich history and deep roots in Sister Bay, WI. Back in the early days, Al was “chief cook and bottle washer.” He did it all. Friends remember a time when he’d serve the breakfast, clean-up the kitchen, and then hang a “Gone Fishin’” sign on the door and head out for an afternoon break, before reopening for the dinner hour. To many of his local, lifelong buddies, “those were the good old days!” Coffee flowed, the talk was rich, and tall tales abounded. Then, in 1960 Al met who was to be his future wife, Ingert. She was the one who helped change and shape the interior décor of the restaurant. With a flair for style, plus deep roots in Scandinavian heritage and design, she felt it necessary to keep the look of the place very traditional. Ingert’s vision included adding a gift shop where people could browse while waiting to be seated. Today, that vision has grown into two very large and welcoming Butiks that have a draw all their own. Al Johnson’s has and continues to be a family run restaurant. Family. Food is served on dishes from Porsgrund, Norway, the decorative rosemaled painting around the interior was done by renowned Norwegian artist Sigmund Arseth. Many of the foods served are Swedish and Norwegian. Everything from the Swedish pancakes, Swedish meatballs to Swedish cheeses and limpa bread are served with lingonberries. For those wanting a more American fare, the menu includes the famed Al’s burger, local perch and whitefish plates, traditional ham, turkey, or clubhouse sandwiches, as well as a full array of salads and daily soups. Breakfast is served all day and is a meal in itself! There is literally something tasty for everyone of all ages. Don’t believe me? Take a drive to Sister Bay and stop at Al Johnson’s. You’ll be glad you did, indeed. The Lingonberry is a small, ruby red berry is a member of the cranberry family. Also know as “cowberry,” or as Newfoundlanders call it “partridge-berry” grows wild in the mountainous regions of Scandinavia, Russia, Canada and in Maine, US. These tart, red berries are available fresh, only in the regions where they are grown. They can be purchased as sauces or preserves and make excellent accompaniments to pancakes and crepes. Empty contents of package into a large mixing bowl. Mix in 2 eggs and 3 cups milk with dry ingredients until batter has a smooth consistency. For best results, refrigerate overnight. Bring a non-stick skillet to medium high heat and melt a small amount of butter in it or spray skillet with a non-stick cooking spray to cover pan. Add approximately one quarter cup of batter to pan, allowing batter to spread by using a spatula or turning the pan to form a pancake. Let batter cook for about a minute, then flip and allow it ti cook on the other side for about 30 seconds. You will see light brown spots and that will let you know when the pancake is done. Fold in half and serve with lingonberries and syrup.